Having healthy snacks ready to go isn’t always easy. I try to make my own granola bars on a regular basis, but I have to be honest, I go through periods of time when I’m lazy. And in those periods, I need to have something to fall back on. Enter Taste of Nature. 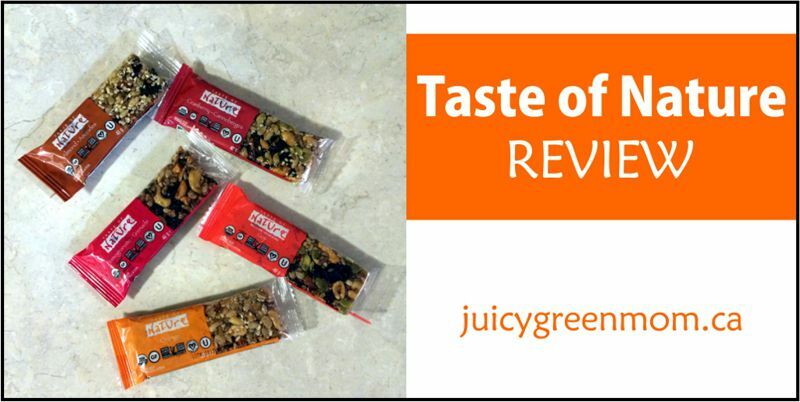 Taste of Nature makes organic food bars that are gluten-free and non-GMO project verified. They are also certified vegan, certified kosher, and have low glycemic index. They have no artificial flavours, fillers, or chemicals and they are full of ingredients from sustainable farms. Sounds pretty fabulous, right? I also love that Taste of Nature uses green business practices, including green energy in their facilities. A company after my own heart! Almond: Yummy nutty bar, with almonds, raisins, and seeds and rice. Cranberry: I love dried cranberries in trail mix, so it’s not surprising that this bar with cranberries and nuts was delicious to me! Pomegranate: Sweet and tart at the same time, it was like a little party in my mouth! Goji: The Goji berry taste isn’t as strong as cranberries, so if you want something less tart, this is a great option. Orange: The smell of citrus was so lovely when I opened this one up! The taste of citrus is not overpowering in the bar, though, it is balanced out by the other ingredients. I love that these bars really keep you going. The combination of fruit and nuts are the perfect snack when I’m starting to get “hangry” in the late afternoon, or a great quick breakfast alternative when I’m running out the door. They were given the approval by my husband as well, which is a very good sign! Taste of Nature bars are widely available (yay!) so that they’re easy to get when I’m feeling too overwhelmed to make stuff from scratch. I’ve gotten them at Bulk Barn, London Drugs, Costco and Shoppers Drug Mart. 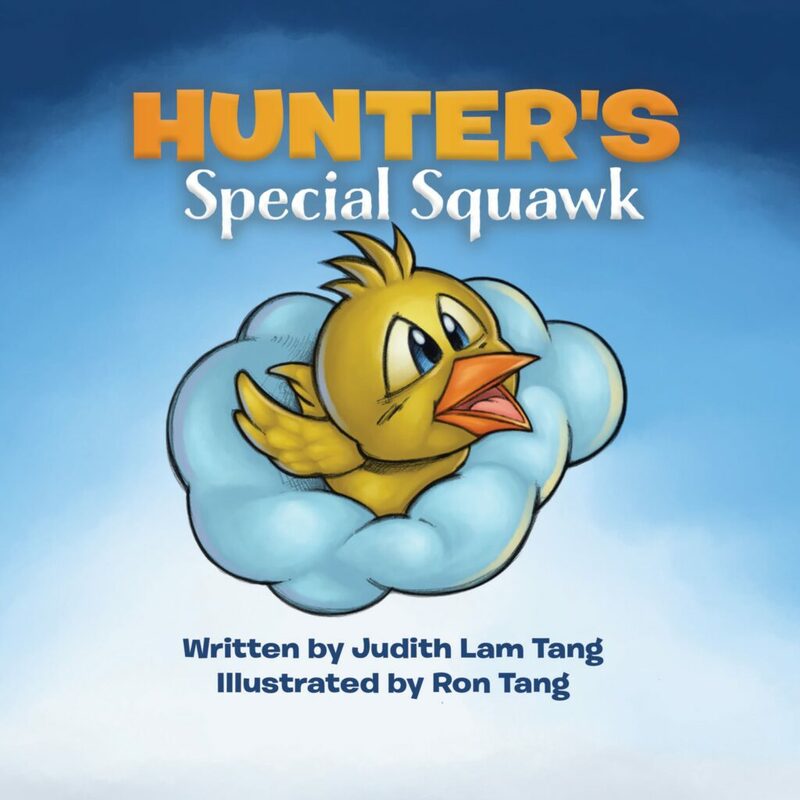 They’re also available on amazon.ca, well.ca, and amazon.com. 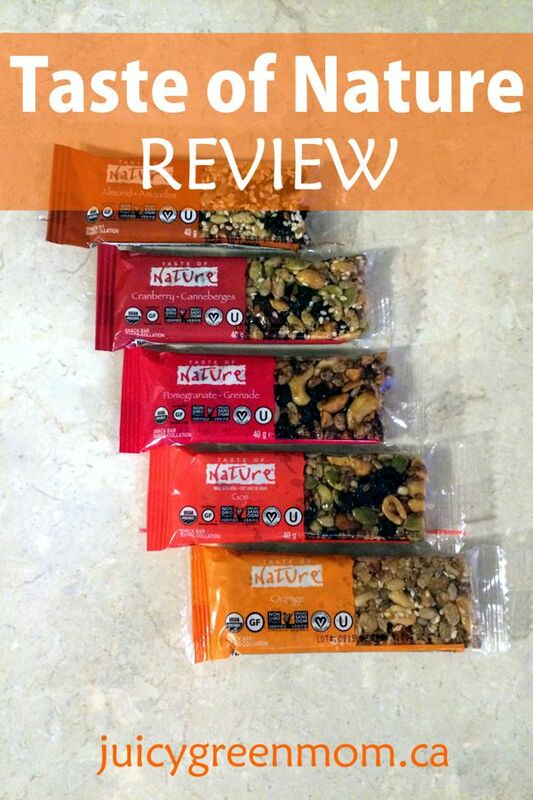 I hope this Taste of Nature review helps you decide if their bars are a good fit for you! What Taste of Nature bar do you want to try first?